In some ways, the most contemporary-seeming pieces are a pair by Robert Brown and James Pennuto that take images of landscape (a tractor-furrowed dirt field; a hill) and print them onto shaped, unnatural mediums (vacuum-formed plastic, acetate). Richard Jackson’s “Negative Numbers” is also strangely fascinating: A wooden table holding two backlit photo negatives, a nearly indiscernible image of what might be a young man posed at an amusement park, with the numbers of the negatives scrawled on top in a very shaky hand. 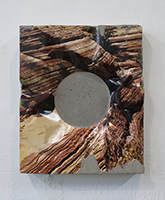 Elsewhere, artists run through every conceivable novelty, trick, and innovation possible: Folding a print into a pillar-shape (Jerry McMillan’s “Patty as Container”); burying an image in thick Lucite, or using a chunk of shaped Lucite to augment the composition of an accompanying photograph (Robert Watts’s “BLT” and “Pork Chop on a Plate with Pea,” respectively); turning a flat scene into a dimensional, Cubist object (Dale Quarterman’s “Untitled”); printing images on all sides of cardboard cubes that can be stacked and rearranged at will. If “The Photographic Object” doesn’t strike the same subversive, controversial blow that its 1970 edition did, that’s understandable — we’re pretty blasé these days about the cross-pollination of mediums. The companion piece to the show, “Fixed Variable,” in a modest side-room down at Hauser & Wirth’s 18th Street gallery, shows how far we’ve come. The young, mostly New York-based artists here, marshaled by the gallery’s Madeline Warren and Yuta Nakajima, are focused more on formal, rather than figurative, aspects. The curators joke that the works can be divided between the “gritty and the griddy,” from Ethan Greenbaum’s prints of street surfaces on vacuum-sealed plastic to John Houck’s mathematically-derived, cleanly-folded C-prints. Warren and Nakajima note a few other defining elements: a reliance on digital technologies; a prevailing sense of humor; and a willingness to use image archives that didn’t exist in the ’70s, like the massive trove of stock and found photography on the Internet. This compact, streamlined show is a winner, and acts as a similar checklist of the tactics available to today’s practitioners. Letha Wilson’s C-prints of rock formations or landscapes embedded in panels of concrete — or in some cases printed directly on concrete — deserve all the buzz they’ve gotten in recent years. (She also has a terrific floor-piece here, a print of a sunset affixed to a curled panel of Corten steel.) Kate Steciw combines shaped frames with sheets of Plexi and hyperactive image collages to make some of the most purely sculptural works, including one that hangs from the ceiling, as menacing as a guillotine. Lucas Blalock digitally edits “real” photographs to create unreal oddities, like a four-pronged mutant cactus. And the show includes three works by Chris Wiley — a pair of the wildly framed “Dingbats” prints recently featured at Nicelle Beauchene Gallery, and a series of wall prints made by cutting faux-marble wallpaper into large stickers. A word to the wise: See “The Photographic Object” uptown first, to appreciate the historical and technological progression between that survey and this current snapshot. The enlightening thing is that, despite the vast terrain covered in both shows, the potentials of photography seem far from exhausted. In many ways, the photograph has become one of many items in the toolbox of contemporary artists — much to the chagrin of traditional photographers, who doubtlessly still grumble about the ways in which their medium is molested along the cutting-edge.